Kinnick's Father At Dedication Iowa City, la. (AP) Nile Kinnick Sr. of Omaha was here Saturday for a short dedication ceremony as the University of Iowa football stadium was formally renamed for his son, Nile. The name change was made last spring after a move was initiated by Hawkeye alumni to rename the 31-year-old stadium for Iowa's only Heisman Trophy winner. 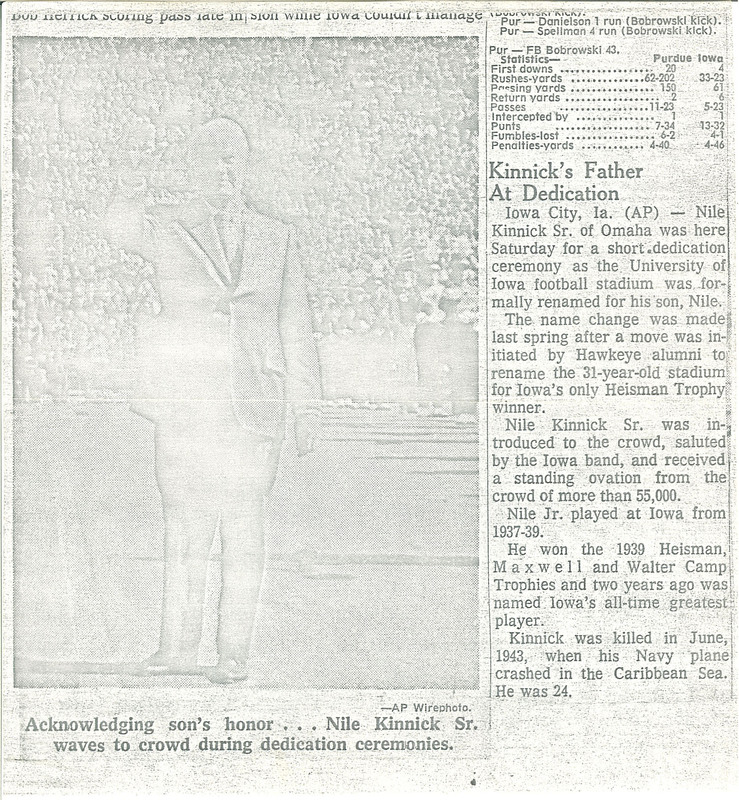 Nile Kinnick Sr. was introduced to the crowd, saluted by the Iowa band, and received a standing ovation from the crowd of more than 55,000. Nile Jr. played at Iowa from 1937-39. He won the 1939 Heisman, Maxwell and Walter Camp Trophies and two years ago was named Iowa's all-time greatest player. Kinnick was killed in June, 1943, when his Navy plane crashed in the Caribbean Sea. He was 24, AP Wirephoto. Acknowledging son's honor . . . Nile Kinnick Sr. waves to crowd during dedication ceremonies.